Pozole (sometimes spelled posole) is a rich, brothy soup from Central Mexico. While it can be made with a variety of ingredients, hominy (a type of maize) is always a key component. Pozole is garnished with lots of fresh vegetables, like cabbage, radishes, onion, and avocado. 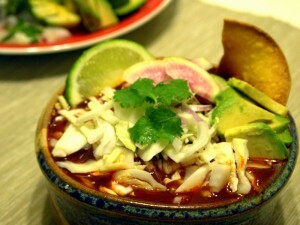 The dried guajillo chilies in this vegan pozole rojo give it a deep red color and great flavor. Coat a baking dish with cooking spray and arrange tortillas on the sheet. Bake in an oven at 350 degrees until crisp, about 30 minutes. 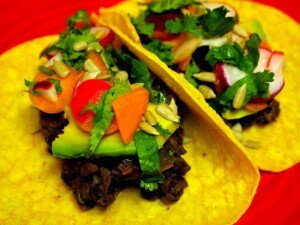 Prepare other ingredients while the tortillas bake. Discard the stems and seeds from the dried peppers. Roast in a large pot over medium heat until they begin to soften, about three minutes. Add two cups of vegetable broth and bring to a boil. Remove from heat and continue soaking for 10 minutes. Puree the chilies in a blender with the soaking liquid 2 1/2 cups or so of their soaking liquid, a pinch of salt, and of garlic. Blend until smooth and set aside. Heat a tablespoon of olive oil in a large stock pot over medium-high heat. Saute onion until fragrant, about 2 minutes. Add ground cumin and continue cooking for another minute. Add oregano, bay leaf, and remaining broth. Bring to a boil over high heat then reduce heat to a simmer. Strain pureed peppers through a sieve and pour into the soup. Add hominy and return to a simmer. Cook for 15 minutes and season with salt to taste. Serve the pozole with prepared garnishes and crisped tortillas. In a large stock pot heat the olive oil over medium high heat in a large stock pot and saute onion until fragrant, about two minutes. Add pepper flakes and cumin and cook until onions are translucent, about three minutes. Add beer and epazote. Bring to a boil then allow to cook over low heat until all of the liquid is incorporated and the beans take on a creamy consistency, about 15 minutes. Remove epazote sprigs and serve. Heat olive oil in a frying pan over medium heat. Carefully lay mushroom slices in the oil and fry on one side until liquid begins to be expressed, about 2-3 minutes. Flip each slice and fry on the other side for another 2-3 minutes. Season with salt and black pepper to taste. To assemble sandwiches, spread a healthy serving of vegan mayonnaise substitute on two slices of bread. 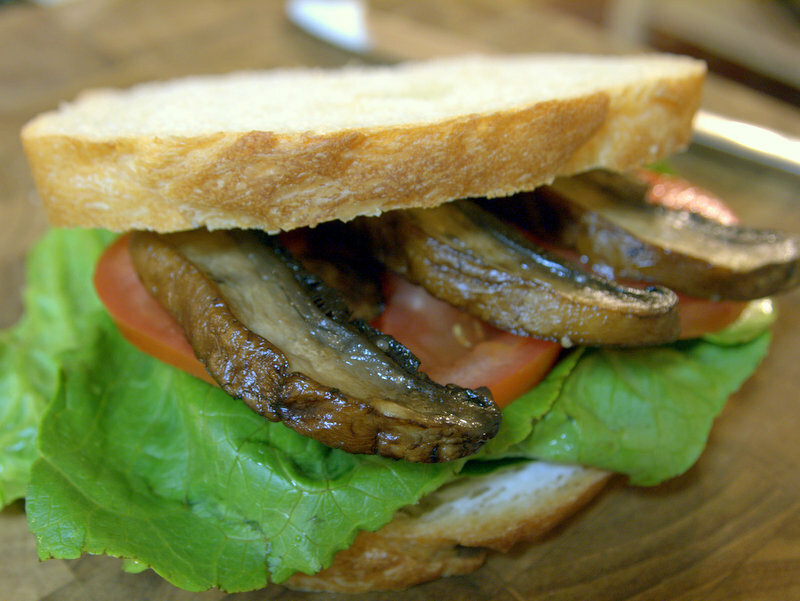 Stack a few lettuce leaves, a few slices of fried mushroom, and one to two tomato slices on the sandwich and enjoy! Prepare tofu batter by pouring almond milk in a shallow dish. In a second shallow dish combine cornmeal, nutritional yeast, salt, and fresh ground black pepper. Dip tofu slices one at time in the almond milk then cornmeal mixture. Place battered tofu on a greased cookie sheet and repeat until all the tofu is battered. Bake at 350 degrees for ten minutes then flip. Continue baking until golden brown, about an additional 10 to 15 minutes. Remove from the oven and allow to cool for a few minutes. To assemble sandwiches, spread a healthy serving of vegan mayonnaise substitute on two slices of bread. 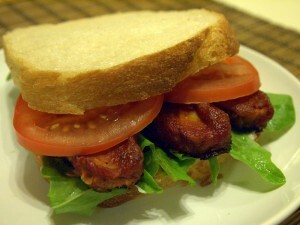 Stack a few lettuce leaves, a baked tofu slice, and one to two tomato slices on the sandwich and enjoy! In a medium sauce pan, heat oil and gently saute onion over medium heat just until the onions are translucent, about 1 minute. Stir in tomato paste,vinegar, water, sugar, chipotle powder, salt, cayenne pepper, and a few twists of black pepper. Once the sauce comes to a simmer, reduce heat to low and cook for about 5 minutes, stirring often to prevent burning. Remove from heat. 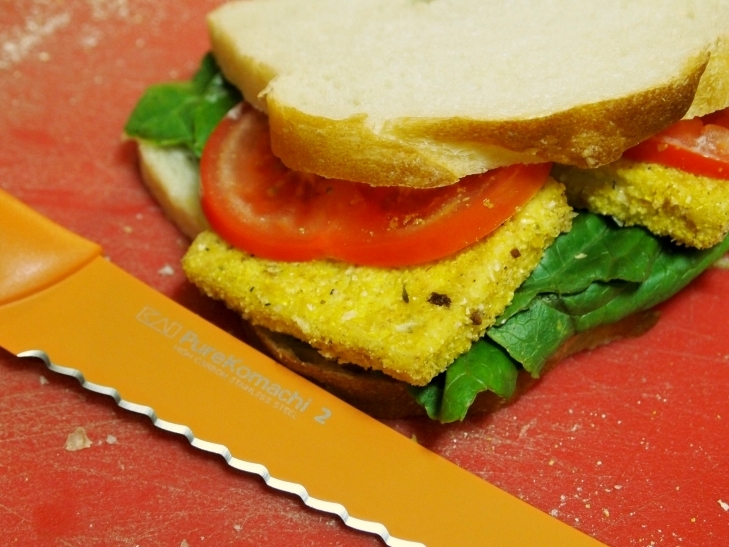 To assemble sandwich, spread a serving of vegan mayonnaise substitute on two slices of bread. Add a few leaves of lettuce, 3-4 slices of baked tempeh, and a one or two slices of tomato. Top with reaming slice of bread and enjoy! Pulse chickpeas in a food processor or mash with a pastry cutter until coarsely ground. Stir in vegan mayonnaise substitute and lemon juice. Season with salt and pepper to taste. Place tofu and mushrooms in a large food storage container. Combine parsley, oregano, garlic, lemon juice, and hot pepper flakes in a food processor or blender. Combine and drizzle with olive oil until the chimichurri mixture is smooth. Season with salt and pepper to taste. Pour chimichurri mixture over the prepared vegetables and allow to marinate, refrigerated, over night. 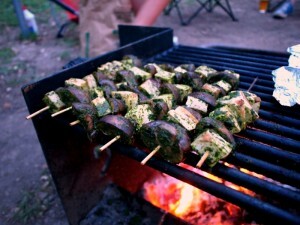 Skewer tofu and mushrooms. Place on grill and rotate occasionally to avoid burning. Brush with remaining chuimichurri to keep moist. Remove from gill and serve when mushrooms are tender. James makes the finishing touches on our Easter Lasagna. For my family the only food we associated with Easter was candy– cheap chocolaty pastel candy. Easter Sunday we would have nice meal, but, since my Mom had no stomach for lamb, there was nothing more special than a little ham on the table which I avoided with a near religious fervor. Until earlier today I had assumed that James’ family had a similar non-tradition, and if there was a tradition it had gone the way of all the other once-adored meat dishes. However, today while he was talking with his Grandfather, Baba, asked if we were making lasagna. Turns out, for some Italian American families the lasagna can symbolize the abundance of the occasion and the season, and a lasagna with spring vegetables, fresh ham, and boiled eggs is the ideal Easter entree. 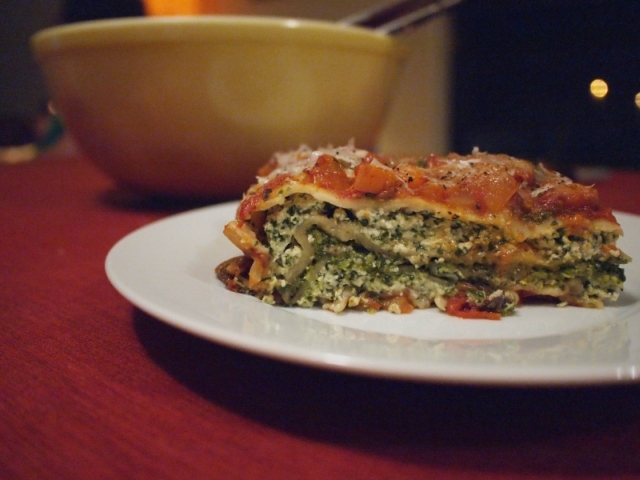 James made lasagna noodles in the same way we made the ravioli dough earlier this year. For the filings we used Swiss chard, which is available in abundance now, and a pesto using the year’s first sweet basil. Prepared or homemade lasagna noodles. If you are using prepared noodles, follow boiling instructions on box. If using fresh or homemade noodles, you do not have to preboil them. In a large sauce pot heat olive oil over medium-high heat. Saute mushrooms until their liquid is expressed. Add onions, garlic, and carrots and continue to saute until the onions are soft and just beginning to brown. Add oregano and heat until fragrant, about 2 minutes. Add tomatoes, tomato paste, and balsamic vinegar and bring to a simmer. Reduce to medium-low heat and continue simmering until thick, about 20 minutes. Remove from heat and season with salt and pepper to taste. Add basil and set aside. To make the Swiss chard filling, combine ingredients in a food processor. Process until smooth and season with salt and pepper to taste. Set aside. To make the pesto filling, combine basil, almonds, and garlic in the food processor. Drizzle with olive oil until the pesto processes. Continue blending until smooth and season with salt and pepper to taste. Set aside. 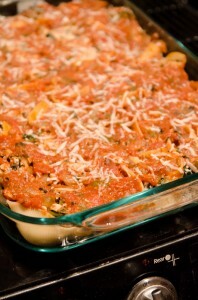 To assemble the lasagna, add half of the sauce to the bottom of the lasagna dish. Top with one layer of noodles, then add half the Swiss chard filling and smooth over the noodles. Add a second layer of noodles then smooth the pesto on top. Add a third layer of noodles and top with the remaining Swiss chard filling. Top with a final layer of noodles then the remaining sauce. Cover the dish with foil, then bake the lasagna at 350 degrees Fahrenheit for 30 minutes. 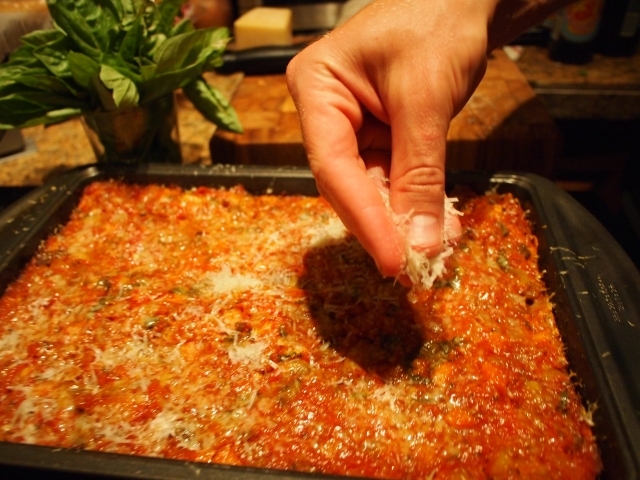 Remove the foil, add a healthy dusting of grated parmesan cheese, then place back in the oven, uncovered, for 10 minutes more. Let the lasagna cool for about 10 minutes, then serve! Steam the swiss chard until slightly wilted, about 2 minutes. Place in a food processor with mushroom caps and pine nuts. Pulse until finely chopped and set aside. Heat olive oil over medium heat and saute ginger, garlic, and spring onions until fragrant, about 2 minutes. Remove from heat and stir in swiss chard mixture. Season with salt to taste. Place a dumpling wrapper on a clean working surface. Spoon a teaspoon of filling in the middle of each wrapper then dip your fingers in the water and moisten all around the outside of the wrapper. Bring the sides of the wrapper up over the filling and press together to seal. Pinch along the seal then place the finished dumplings on a plate dusted with flour. To steam the dumplings, place the dumplings in a steamer and steam over high heat until the mushrooms are cooked, about 15 minutes. While dumplings are steaming, combine the dipping sauce ingredients in a small bowl and set aside. 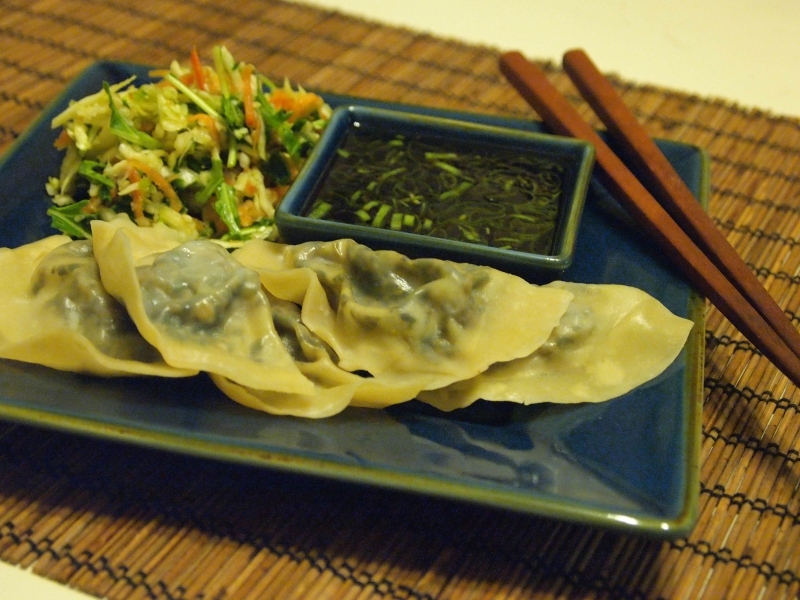 Serve dumplings immediately with sauce. 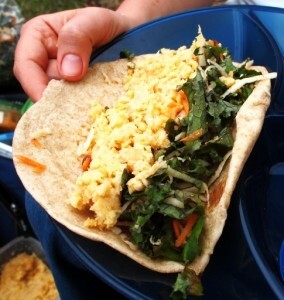 Tofu takes the place of cheese in this stuffed shell recipe. The addition of dandelion greens and walnuts it is not only a healthy choice, it is very tasty! Heat olive oil in a large skillet. Over medium heat saute the onion until it is tender. Add garlic and continue cooking until fragrant, about one minute. Add dandelion greens, tofu, and walnuts. Continue cooking, stirring continuously, over medium heat until the greens begin to wilt, about two minutes. Stir in the lemon zest, season with salt and pepper to taste, then remove from heat. Stuff the shells and arrange in a large baking dish. When the dish is at capacity top with sauce and a little grated Parmesan cheese or cheese substitute. Bake at 350 degrees until sauce simmers, about 15 minutes. Gluten-free variation: Substitute gluten-free shell or manicotti pasta, or roll the filling in blanched Brussels sprouts greens or collard leaves.